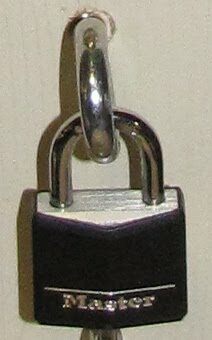 Lockpicking is an interesting and necessary skill for physical penetration testers. I recently began learning about the various types of locks and how to pick them. I picked up Deviant Ollam’s “Practical Lock Picking” book based on the great reviews I have seen. Using this as my guide I have been learning the art of lock picking. The problem I was having was finding locks to practice on. In the first few pages of the book the director of TOOOL Babak Javadi comments that one should follow two golden rules when picking locks: 1. Do not pick locks you do not own, and 2. Do not pick locks on which you rely. Strictly following these rules limited me to not having much to practice on. So I decided to buy some locks and build my own lockpicking practice station to practice on. My lockpicking practice station consists of 6 locks. All of them are pin tumbler locks. I tried to buy locks of varying difficulty so I would have different challenge levels. To assemble the station I needed a piece of wood 1-3/8” thick to attach the knobs too. I decided to just buy a cheap door. I cut the holes for the knobs using a hole saw and a template that screwed in place to prevent it from moving. After I installed the knobs I installed the sash lock. Finally, I used a couple screw hooks to make a place for the two Master locks to hang. To complete the station I cut the section with the locks out of the door and attached it to a wood base so that it would sit upright. My fully completed lockpicking practice station can be seen below. It may not be that pretty to look at but it is functional for my needs. There are a few things I would have like to have done differently so I may end up building another one some day.